Affirmators! illustrator, Naomi Sloman, is no stranger to depicting wit, whimsy, and playfulness throughout her projects—just look at her “Gangsters A-Z” chart below, which envisions notorious pop-culture gangsters as lovable animals (Al Capone is a bulldog!). Read on to learn more about this Brighton, England illustrator’s daily inspirations and what makes her tick. 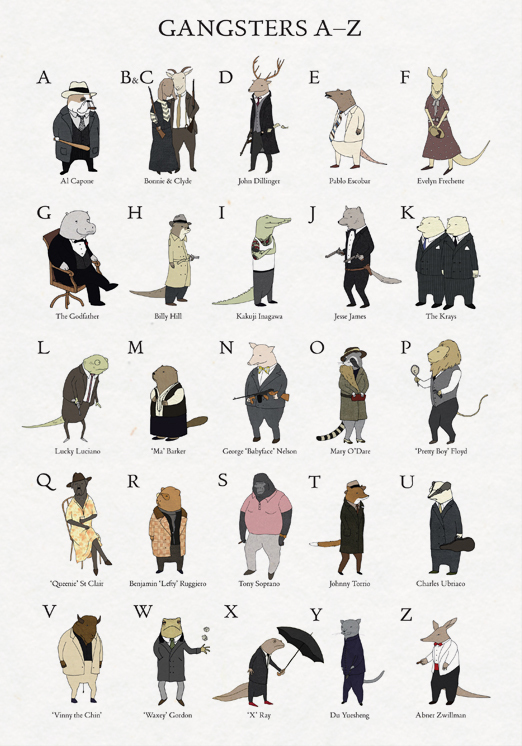 Naomi’s “Gangsters A-Z” chart—gangsters illustrated as animals. Q. How did you get into illustration? A. Art was always my favourite subject at school and I was always drawing and making things at home. I ended up with a degree in modern languages though and then a job in business PR for a few years, but the lack of creativity didn’t suit me. So I went and studied part-time as a mature student at Camberwell College of Art in London. After that, I stuck with part-time jobs and spent the rest of my week working on building an illustration portfolio. 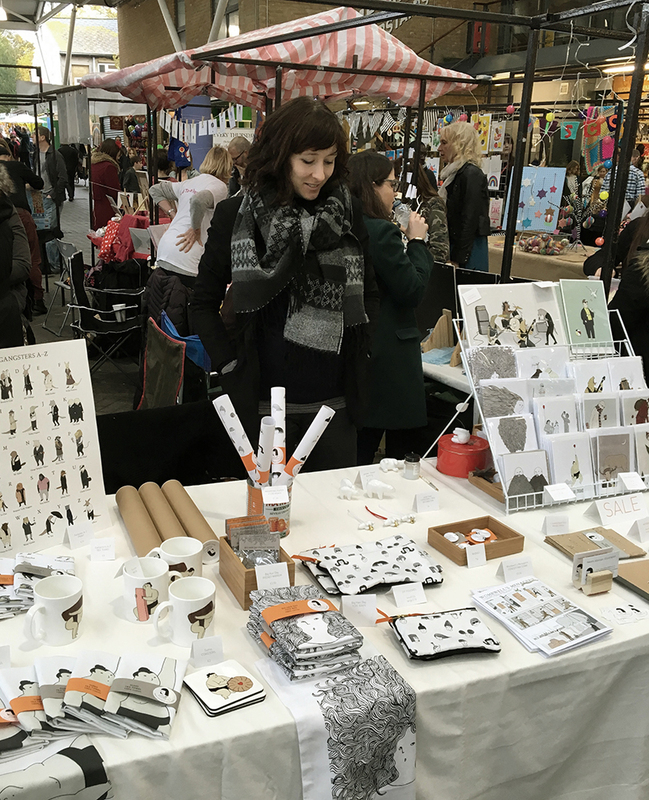 When I felt ready I set up an Etsy shop, got some of my products into independent shops and approached magazines for commissions. Naomi showcasing her stuff at the market. Q. Do you have any advice for aspiring illustrators out there? A. I think I would pass on two pieces of advice. Firstly, working a day job and trying to become an illustrator at the same time is hard work—do what works best for you! For me, working at the same time as becoming an illustrator has meant that it’s taken a long time to get to where I want to be. I would love to have ditched the day job to focus completely on illustration. Unfortunately, if you have financial commitments it’s not so easy to do! Secondly, do things when you feel ready. I held back when it came to putting my illustration work out there. I had some pressure to start approaching shops with products and magazines for work before I felt my illustration style was fully developed. I trusted my own instincts and did so when I felt confident in what I had to offer. It made me much more certain that I could fulfill other people’s demands and produce quality work, and at the same time feel pleased with the end results. Q. Where do you find the most inspiration for your illustrations? A. I like mundane [things] made offbeat with unusual details or subtle humour. I like observing people—their physical attributes, style, character. Quirky people attract my attention and their characteristics often make it into my work. Travel also inspires me. I always take a sketchbook on longer trips, and I have work in one from Japan and one from Argentina that I particularly would like to develop . . . when there is time! 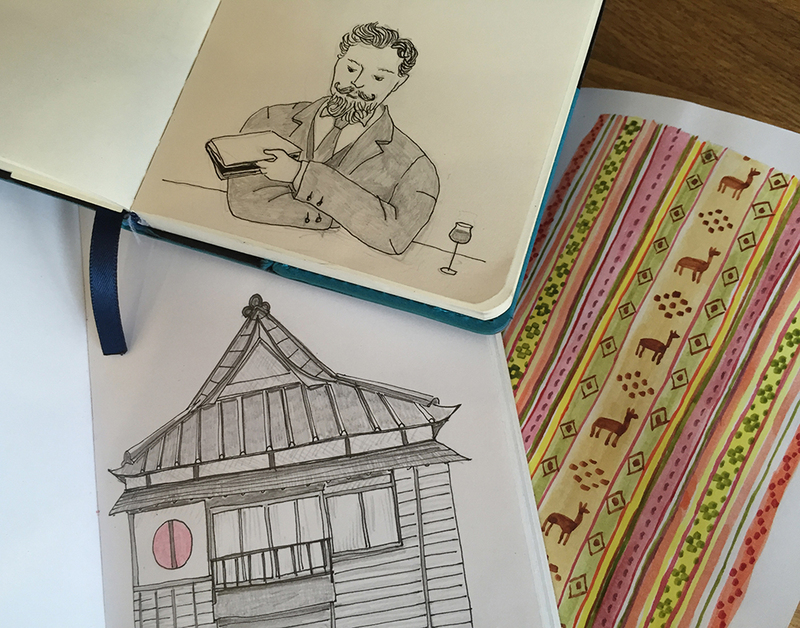 A peek inside Naomi’s travel sketchbooks. Q. What’s your favorite Affirmators! card? A. I think I would have to go with “Joy”. I didn’t know who Orville Redenbacher was when I first read the affirmation, and when I looked him up I knew I had to turn him into a piece of popcorn! I enjoyed drawing the joyful popcorn and I think the image succeeds in projecting that sentiment. I was also really pleased with my Viking cells for the “Vitality” card. They’re a happy bunch too! 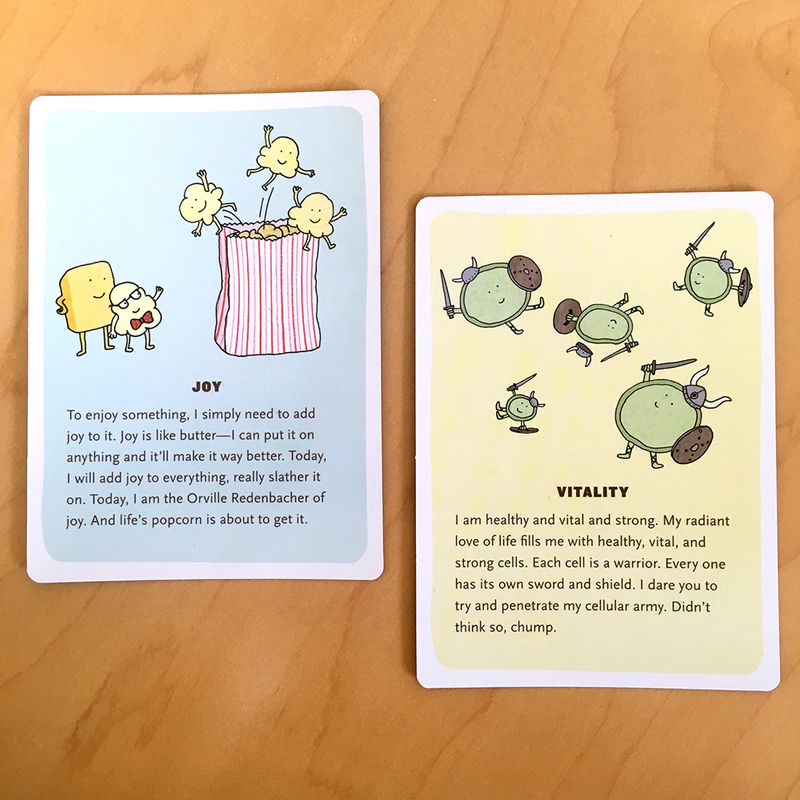 “Joy” and “Vitality” Affirmators! cards—a few of Naomi’s favorites. Q. In a parallel universe, what other occupation would you have and why? A. Would this parallel universe be warmer? I’ve always liked the idea of working outdoors, but I don’t think I could handle it in the winter months! Something like a forest ranger or an archaeologist could be fun and interesting. Q. Do you have any hobbies outside of drawing? A. I recently started playing electric guitar again after quite a few years of neglect. I got myself a fantastic teacher and I’m really enjoying it and seeing huge improvements. 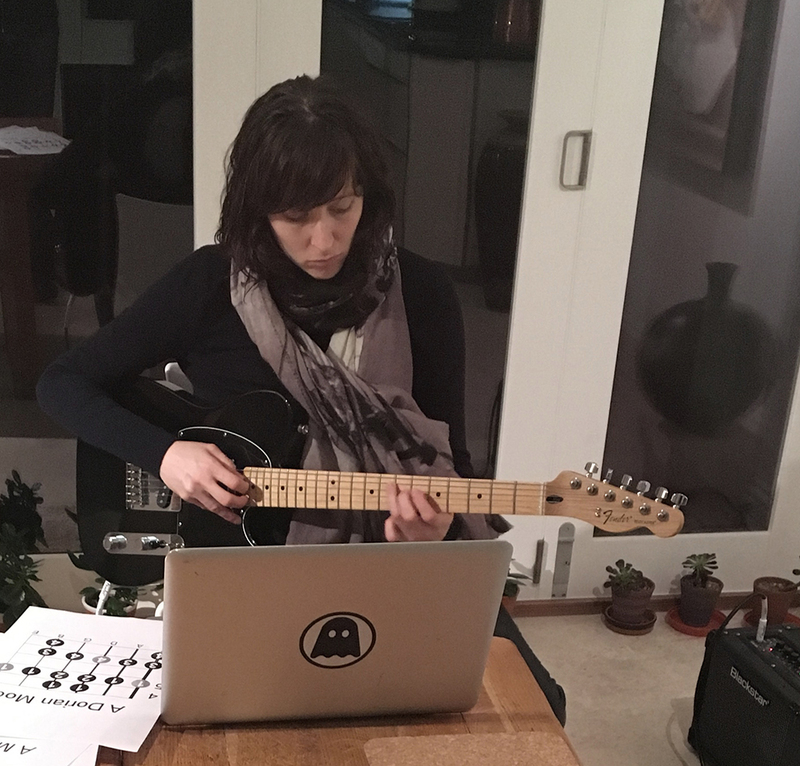 One of Naomi’s hobbies—playing guitar! Q. What is one random fact about you that no one necessarily knows? A. I have a large and growing collection of Spanish paprika tins, which I buy whether or not I actually need the paprika inside! 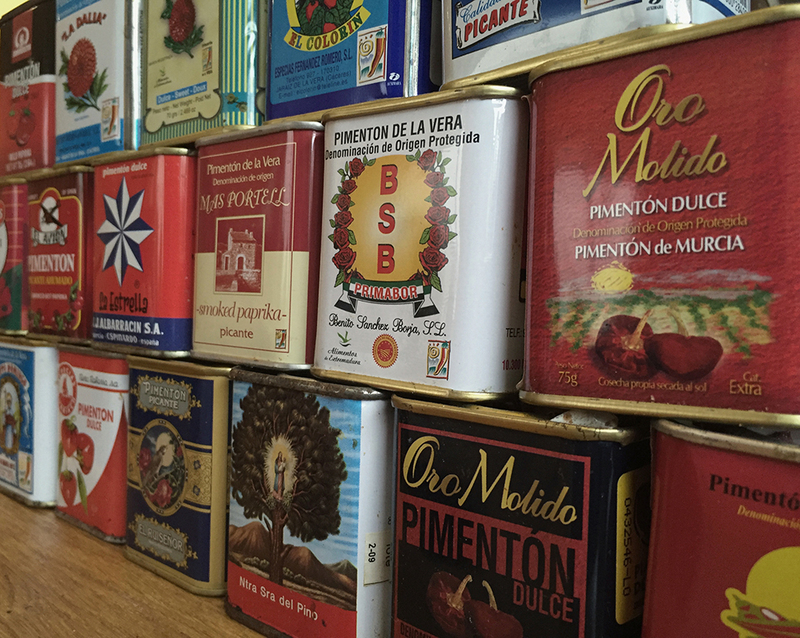 Naomi collects Spanish paprika tins. Here’s her collection so far. Q. If you could adapt any movie into a book illustration, which movie would it be and why? A. A film by Pedro Almodovar would be fun to adapt. His films are filled with complex characters and unusual looking people who would be fantastic to illustrate. And I love the humour in films like I’m So Excited! and Women on the Verge of a Nervous Breakdown. So, one of those probably. 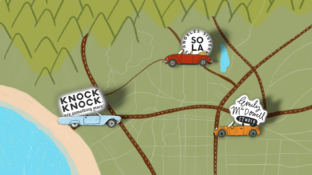 Q. What’s your favourite Knock Knock product and why? A. Can I have two? I love Gemma Correll’s illustrations and I’m about to become a parent for the first time so 100 Reasons to Panic™ about Having a Baby is speaking to me! I also love the Fake-Jacket Journal to “disguise” your sketchbook. I’d love to see the look on someone’s face when they try to work out whether Autobiography of a Plant is a real book! Q. You mention in your bio that you like to cook. If you could cook dinner for any fictional or non-fictional character, who would it be and why? What would you cook? A. I do love cooking! And I would want my guest to really appreciate and enjoy my food, and I like serving up big portions and second helpings, so I think the perfect choice would be Joey from Friends! I would cook something not too fancy but really hearty and full of flavour like a good paella accompanied by a quality bottle of Rioja. 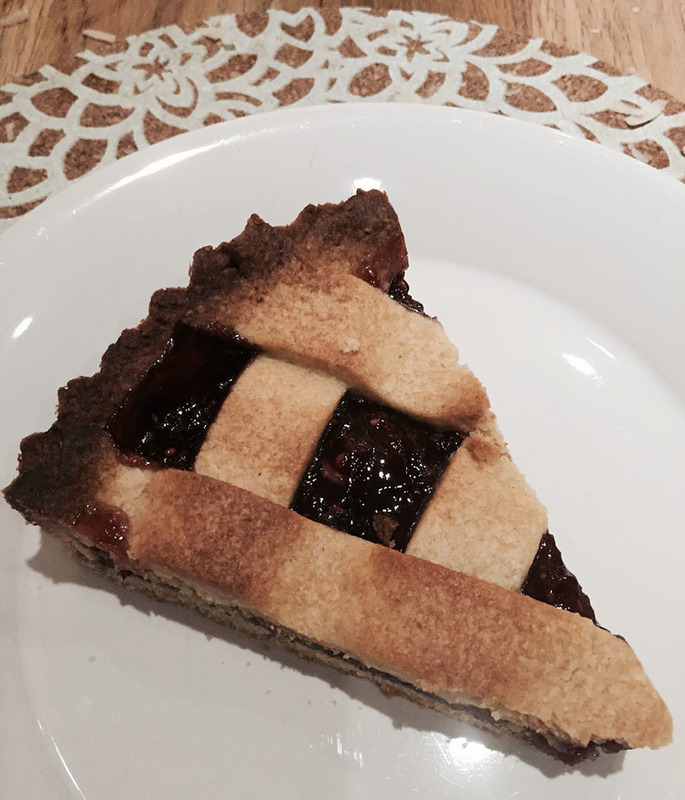 For dessert, a Linzertorte—I made one the other day and it was absolutely incredible. Q. What are 5 things on your bucket list? A. I don’t really have a bucket list. I’ve done quite a few exciting things so far in life and I don’t think there is anything I would be sorry not to have done if I ran out of time. There are always places I want to travel to though, so making trips to Southeast Asia, the Peloponnese in Greece, Lyon (the gastronomic capital of France), Norway, and revisiting Japan are high on my wish list! 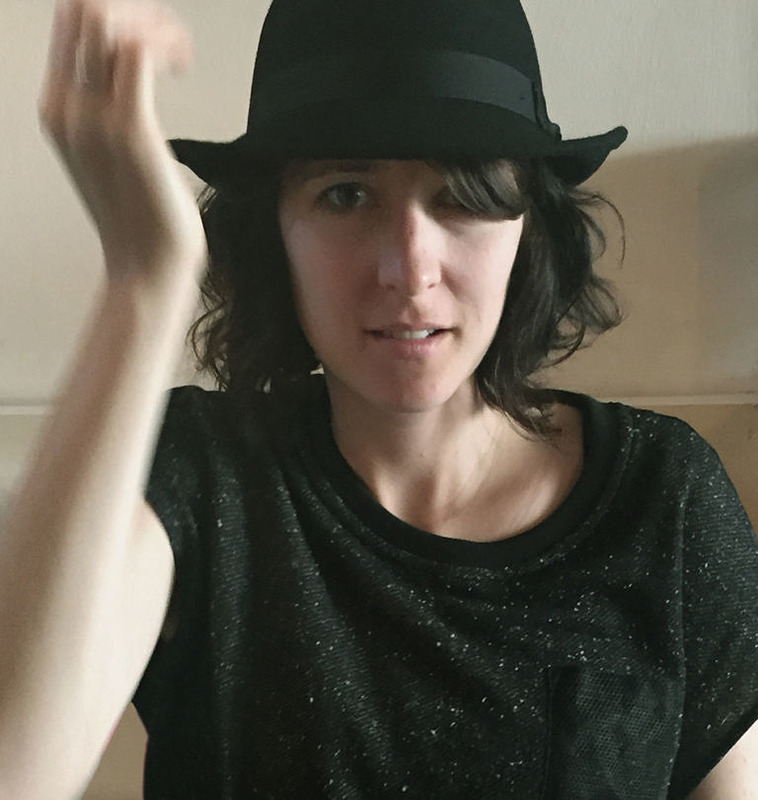 For more updates on Naomi’s work, “Follow” @NaomiSloman on Twitter.